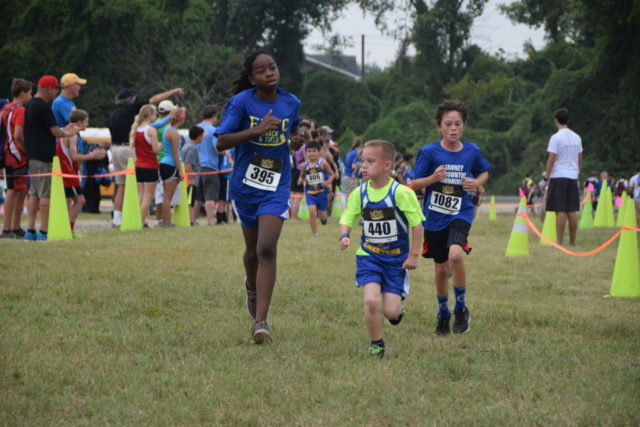 There was big news spreading at the DCXC Invitational, after the elementary school races. Two girls were eager to share it. That wasn’t even the big news. Both were treated with equal praise by coaches and teammates and that, in large part, speaks to the promise lying ahead for young cross country runners. In a sport where participants are definitively ranked — someone is first and someone is last — the big challenge for coaches is to keep kids in the sport, developing their skills but staying patient and keeping runners engaged. Dereck Barnes has been coaching the Fairfax Police Youth Club for three years, after his daughters noticed of how much he liked to run and asked to do it himself. And soon, he had been recruited to coach. He was on the cross country team at Methodist College in North Carolina, so he came in with a lot of experience, but he still needed to refine it. More than at any other level, a youth coach’s role is to hold the athlete back. Three times a week, FPYC practices in some Fairfax County Park where the runners can stay on grass. As a child in Fayetteville, N.C. Barnes ran Junior Olympic track events and was impressed by the levels of organization to the sport and the chance to run against and meet other athletes from across the state, region and country. His older daughter, Aiko, is a fan of long distances — she enjoyed running the Junior Olympic 3,000 meters in track and longer cross country races. Even so, she’s still a sucker for flash. At DCXC, she and her sister Aoi got a kick out of making funny faces in the New Balance photo booth. As for Aoi, “I love to compete,” she said. In D.C,’s Tenleytown neighborhood, Janney Elementary School has had a team for three years, now co-coached by Jenny O’Connor. Though she was a soccer player in her youth, she has run road races, including the Boston Marathon, and her fellow coaches are triathletes. There’s a little more pressure because with a volunteer coaching staff, managing athletes’ safety forces coaches to make cuts to keep the team manageable. Her son, Seamus, took up running after seeing how much his parents enjoyed it. Kathryn McKinney has been coaching at Oyster-Adams Bilingual School in Woodley Park for five years. Like the Janney coaches, she’s a volunteer. And even though her athletes have finished running, she’s sticking around to see two former runners, now freshmen at Wilson High School, race later in the day. Vincent Kamani is one of them. Now an eighth grader, he joined the team last year after a lot of soul searching. He was the top finishers on the Oyster-Adams team, taking eighth place at DCXC. Kamani had a rough first year adjusting to that level of exercise, but after training trough the hot 2016 summer, he felt something click. McKinney tries to keep the workload, as light as it is, from intimidating her athletes. And it’s been working. For a school of roughly 170 people, the team sports 50 runners. Her son, Alexander Walch, runs on the team. He prefers the 800 meters, so when he starts high school he may just opt for track, but even so, cross country has been teaching him lessons. Kamani said he can transfer the mental focus he has developed from running to anything else in his life.